Rathi Ramasamy provides support for the HMA Community Strategies team in the Los Angeles office. Her social service experience drives her passion for developing strategies to address social determinants of health and advance health equity. She is skilled in program design, policy analysis and advocacy, qualitative and quantitative data collection and analysis, data visualization, and grant writing. Prior to joining HMA, Rathi completed an administrative fellowship at the Hospital Association of Southern California. She worked on developing a new community health LLC called Communities Lifting Communities, an initiative engaging member hospitals in coordinated efforts to reduce health disparities. 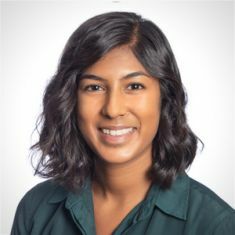 As a graduate intern at The Children’s Partnership, Rathi managed a research project identifying and promoting best practices for improving oral health care delivery for Medi-Cal-enrolled children through strategic investments in Federally Qualified Health Centers. She also assessed community needs, policy and financing landscapes, and emerging solutions to support organizational expansion into juvenile justice and mental health work. Rathi earned her Master of Public Health in Health Policy and Management from UCLA. As a graduate student, she was awarded funding through the UC system-wide Big Ideas contest to develop a clinical training toolkit integrating creative arts in health care delivery. She received her bachelor’s degree in English from Denison University. In her spare time, Rathi enjoys traveling, yoga, and live music.